The “granaries of the pharaohs” in Biblical tradition, treasure chests containing the wisdom of ancient civilization for the scholars of fanciful archaeology, the pyramids are the materialization in stone of the religious concepts and technical knowledge of a culture that prospered on the banks of the Nile more than four thousand years ago. 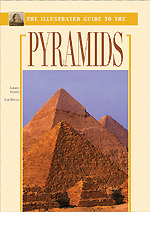 From the world-famous stone giants of Giza to the more modest mud-brick structures of the Middle Kingdom, this most comprehensive illustrated guide ever to the Egyptian pyramids describes over sixty pyramids, temples, and tombs, including all the principal pyramids and the great Memphite necropolises of the Old Kingdom, in the light of the most recent excavations and research. Through photographs, maps, plans, and reconstructions in full color, readers can explore the greatest monuments left behind by the ancient Egyptians.